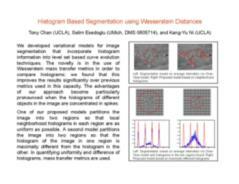 Chan, T. F.; Esedoglu, S.; Ni, K. Histogram based segmentation using Wasserstein distances. Proceedings of SSVM 2007. Ni, K.;Bresson, X.; Chan, T. F.; Esedoglu, S. Local histogram based segmentation using Wasserstein distance. International Journal of Computer Vision. 84:1 (2009), pp. 97-111.